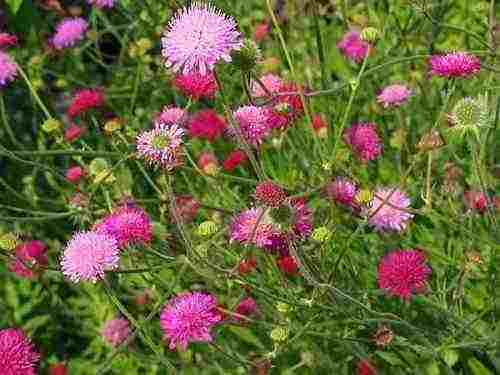 Growing Knautia From Seed For Your Cut Flower Garden. Knautia has a silent k…as in naughty but nice. They are often confused with scabious…well by me at least…one suspects they are from the same family…no doubt Miss Wells will set me straight on that. Anyway…they are clump forming perennials that originate from the Balkans, in fact I think they are the only flower in the Higgledy Garden that originates from that region. Knautia has a long flowering period from early summer right through until early autumn. I have made a bed dedicated to just growing perennials for cutting…although perennials generally don’t produce as many blooms over the season as annuals they do have other benefits…one being that they are tougher so if we have another tricky spring they will be less trouble than growing annuals. 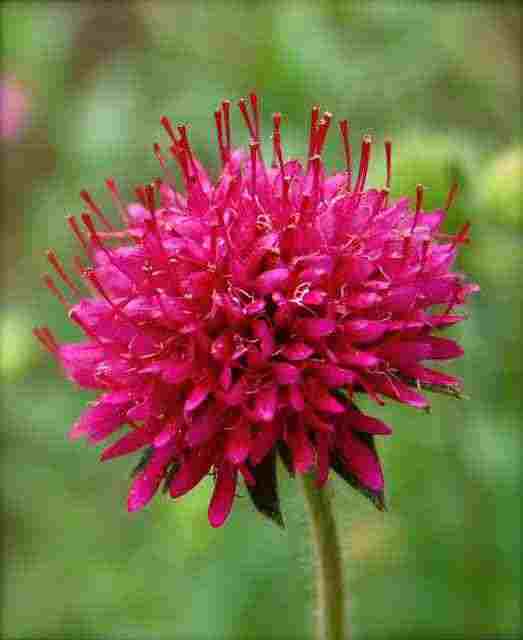 The flowers of our friend Knautia are usually maroons, reds and pinks. The seeds are super easy to get going…I start mine in module trays in the green house from early April. You can use a windowsill but better would be to invest in one of those small, cheap and cheerful PVC greenhouse things…usually they are only about £20, you can take them down after six weeks and put them away until next year….very useful in my opinion. Cover your seeds very lightly in compost and keep moist. After about six weeks you can harden them off to get them ready for planting out. Plant them to about a foot apart. Mature plants can be divided in spring should you wish….before you know it you will have a field of the little darlings. Plant them in a bed that gets full sun…they like a slightly alkaline soil…but I never pay any attention to that sort of thing…and they have grown well in all the cut flower gardens I have asked them to grow in. Though I wouldn’t like to try them in heavy clay. A moisture retentive mulch put around the plants will keep them happy. In the winter the plants die back entirely…but rest assured they will be back for some sun worshipping after they have rested. You may find they happily self seed. “Knautia ‘Melton Pastels’ is a mainstay in the Higgledy garden…although in a different botanical genus to Scabiosa…they are very close…if not holding hands. 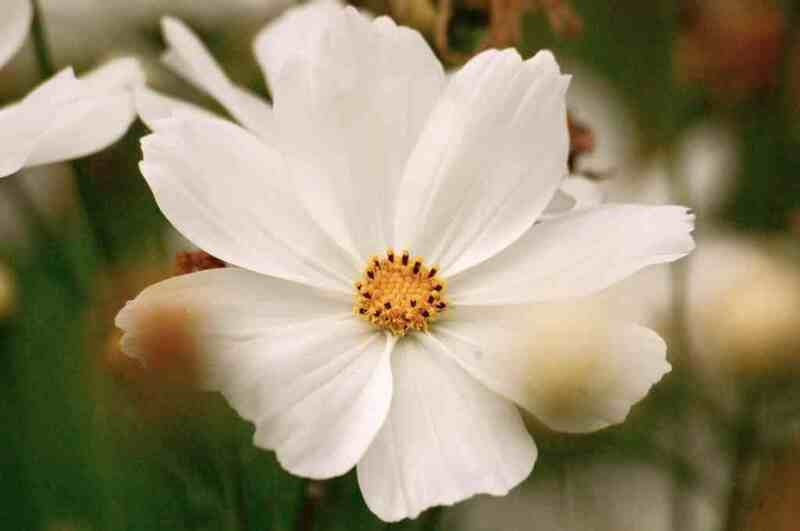 These come in a range of subtle shades and are nothing short of a joy to grow from seed and growing to a metre or more tall they make awesome cut flowers.” Higgledy Seed Shop. Knautia always looks amazing with the pure white of Cosmos ‘Purity’ and spiky Echinops ‘Ritro’. Have fun one and all….these gales will die down soon enough….spring is on the way and she will be waving her frilly knickers in the air before we know it. PS We have a Facebook page if you do that sort of thing…and a Twitter feed that you are more than welcome to join us on…but be warned you may have to put up with my jokes. Cleome Seeds. Germination Tips. Growing Malope Trifida ‘Vulcan’ From Seed. I am just using this opportunity to say that I hope your nursery and planting out is not being devastated by the floods. Love all you tell us and the beautiful flowers you grow. Have lots of seeds left from last year which i will – when the flood goes down – plant out again.